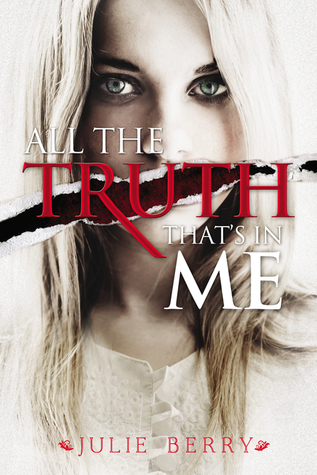 Review: All the Truth That’s In Me is most certainly one of my favorite of 2013. I was anticipating its release, but I didn’t expect to love it as much as I did. Distinctive, melodic, and gorgeous are the best words I can think to describe All the Truth That’s In Me. The book is seemingly simplistic with its word choice, but is full of beauty. Told in second person, AtTTIM has a unique prose. The second person narration didn’t bother me at all, and it took me no time at all to adjust to the style and it makes me wish that more authors wrote in this style. The setting is vague but descriptive. This book is a historical novel, but I couldn’t tell you when it takes place. The small town greatly shapes the characters’ actions and was an element I most loved in the novel. I admit that some characters kept getting mixed-up in my head because I couldn’t keep all of the old-fashioned names straight. I never lost track of the main characters though. Judith and Lucas are tragically flawed, but I rooted for them the whole novel. These are some of the most fantastic characters I’ve read in some time. Quite a few of them surprised me, others I despised, but every single one elicited some sort of reaction. Really, I don’t want to spoil any of this novel’s loveliness. I felt a wide range of emotions while reading All the Truth That’s In Me that have stuck with me. I keep flipping through the pages, wishing I could read it for the first time all over again. Have any of you read AtTTIM? If so, what did you think? I am always up for book discussions. Yay! I am always glad when I can help someone find a great new read. The second person is really just Judith telling the story to a central character, and because of that she uses things like “you did this” although in a much more refined manner than my example. 🙂 I hadn’t pegged this one as a historical novel either when I first heard about it, but I liked what it added to the story. I’ve been hearing a great deal about this book, and I’ve been seeing it around the blogosphere lately=) The cover gives me the chills already! I’ve only just gotten into historical fiction this year and from the fact that you love it so much, I KNOW I HAVE TO GET READING!!! EEE!!! The cover is so creepy and perfect it! I don’t normally read a lot of historical fiction, so this book was so great because the historical part of it isn’t really defined so much as implied. I hope you love it as much as I do! You will need to let me know what you think. I loved this book! The second person did throw me off for a little bit but by then I was so engrossed in the story that I didn’t really care. Also it kind of added to the story. I’m so glad you liked it! But yes, AtTTIM was so lovely, but also so sad. I am glad that you like it too.